The world knows me best as the fastest man alive, the superhero called The Flash. I can run quicker than light. I can vibrate to other dimensions. I have fought gods at the edge of time and space. But sometimes being a hero is not enough. My tale takes place in my hometown of Central City. One morning I was having breakfast in my favourite café with my favourite person in my life, my wife Iris Allen. We were talking about my need to slow down. “I worry about you Barry,” Iris said. Iris made a good point. She’s the smartest person I know so I always try to listen to what she says. As I was about to reply I looked up into the sky and saw a shower of paper fall to the ground, floating gently in the stillness of the morning. One of the pieces of paper landed on our table and appeared to have some writing on it. I picked it up and read it. In crayon it said, “I need the Flash.” I looked up into the sky and at the top of the building I could see someone sitting on the edge of the building. Without hesitation I began to run. 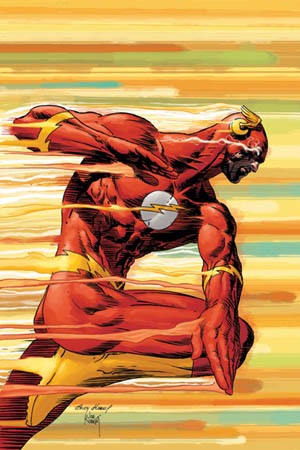 I became a crimson and gold blur as I changed into my uniform and defied gravity by running up the side of the building. I arrived at the top before the final papers could hit the ground. Sitting on the edge of the building was a little boy. “That was quick,” the little boy said. “Quick is what I do best,” I replied. The little boy swung his legs around and stood up. He was tiny in frame with thick glasses that made his eyes look too big for his head. He wore a red t-shirt with my lightning emblem on the chest. He walked up to me with his hand outstretched. I took his hand firmly in mine. For a moment the morning sun caught Jarrod’s glasses and I could see sadness in his eyes. I felt myself involuntarily exhale. Jarrod looked down, paused and then looked up again. He suddenly seemed taller as he gathered himself to make his pitch. I could tell he had rehearsed this many times in his head and this was his moment. I didn’t know what to say. My best friends are the greatest heroes the universe has ever seen. I have stared down the worst of evil and indeed returned from the dead. Yet never had I felt more powerless. I felt terrible but what could I do? Jarrod looked at me, blinked twice, then nodded. I looked at the little boy my mind racing searching for a solution. For the first time Jarrod smiled. I picked Jarrod up and had him wrap his arms and legs around my back. I ran down the side of the building, one arm holding onto Jarrod to keep him in place, his arms tight around my shoulders. We ran through the streets of Central City, people moving so slowly it was like running through a city of statues. I could hear Jarrod squealing in delight and while I enjoyed his excitement my heart was heavy with the fact that I could not bring his father back from the dead. Within the blink of an eye we arrived at his home. The door opened and a woman appeared in the doorway. Her dark hair fell across her face, her clothes hung limply from her frame, her eyes red with what looked like tears. She was beautiful even in this distressed state. She barely noticed I was there looking straight at her son. I thought his Mother might start crying. “You have a lovely son,” I said. I felt bad for using such a cliché but I didn’t know what else to say. Nothing I could say would take away her obvious grief. Jarrod’s mother shook her head. Jarrod’s Mum shook her head. Jarrod shuffled his feet and walked inside. I looked at his Mum. I knew I had done something wrong but I wasn’t certain what that wrong thing was. She looked at me and smiled a sad smile. I didn’t understand what she meant but before I could say anything she explained. She was right. After all the good things I have done the last thing she needed was a man in red tights setting an example that no boy could live up to. I nodded. It was best I left as soon as possible. As I started to turn I had an idea. The next day I rang the doorbell at Jarrod’s house. Inside I could hear Jarrod yell to his Mum that he was going to answer the door. I could hear his Mum yell back that she had the door. As the door opened they stood there together and looked at me.